Don't be shy. You are a badass. When you ask for help, make sure you’re asking the right person. Everything from the friendly baristas to the variety of handcrafted drinks is great…until it isn’t. Love and happiness are human necessities and should be at the root of everything we do. In business and the workplace, it's easy to lose sight of those values for the sake of revenue and quantity over quality. But not for LO:LA (London: Los Angeles). We know a thing or two about work-life balance at Cross Campus, and we’re happy to share our 4-step recipe for success. Whether you spend your days dreaming about what’s for dinner or occupy too much time worrying about upcoming meetings and presentations, take a moment to learn how to become mindful and turn your personal and professional anxieties into non-entities. Cross Campus was created to foster meaningful relationships and work-life balance between movers and shakers. After a few years in the business of balance, we know a thing or two, and we’re happy to share our tips and tricks with you. When you work from any of Cross Campus’s flexible workspaces, no-cost activities are steps away. Mackey Creative Lab of Cross Campus Old Pasadena is here to boost your brand and get you ahead of the competition. We sat down with member company Parent Revolution to learn how they're enriching the lives of underserved students and parents in Los Angeles. Embodied, a member company at our Old Pasadena space, raised a spectacular $22 million in Series A financing. Food, entertainment, dating - nowadays, everything is on the go. Why not apply the same to your personal development through podcasts? May is National Meditation Month. To celebrate a practice that is near and dear to us at Cross Campus, we spoke to Dina Kaplan of Mela, a Santa Monica member company. Business is about building and nurturing relationships. No one understands that better than Creative Fish Studio, a member company at our South Bay location. We all could use some advice on how to better manage our time. Learn a thing or two about getting more from your day from leaders in every industry. As vacation season approaches, are you feeling pressed to get more work done? Cross Campus can provide some relief in the form of no-brainer productivity hacks. We met with the Holistic Chamber of Commerce, a member company in Pasadena, to learn how they are working to create happier people and a healthier planet. 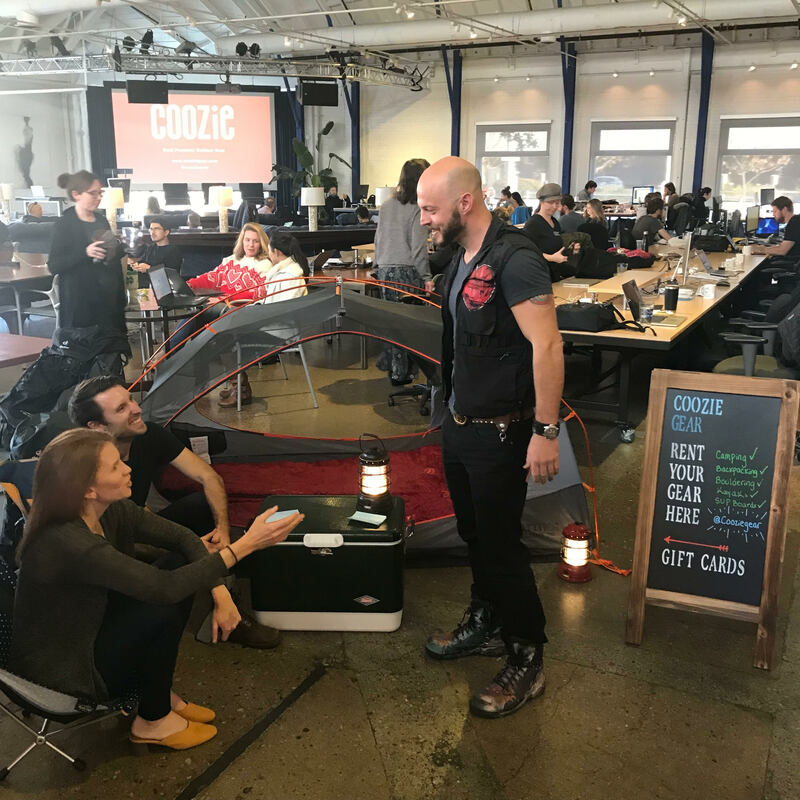 We met with Santa Monica member company RideAmigos to learn how they are working to reduce traffic, better the environment, and increase commuter happiness. We met with Slingshot Aerospace, a South Bay member company, to learn about how they're changing the game in the world of signal processing AI. With the long-awaited grand opening of Cross Campus South Bay finally happening, we know a thing or two about reaching your goals. With the long-awaited grand opening of Cross Campus South Bay January 2018, there's no better time or place to be starting your latest business venture. We met with Tommy, a creative agency and Downtown LA member company, to learn about how they ideate and deliver award-winning digital experiences. Learn why Cross Campus South Bay is the place to be for those looking to cowork in El Segundo. Out with the old and in with the new! As we ring in the new year, we're more than ready to start checking goals off of our list of entrepreneurial resolutions. We met with Pasadena member company Energy Financing Hub to learn about how they're shaping the future of the solar industry. We sat down with Santa Monica member company Leaseful.com to talk about how they're changing the college housing game. In five years time, what do you hope to accomplish? On October 1, 2017, Cross Campus turned five years old. We met with Downtown LA member company Grid110 to learn more the DTLA startup ecosystem and what they're doing to support it. Not all heroes wear capes. This much is true of Honor Media's Founder/CEO and Cross Campus member David Tenenbaum. We teamed up with Pasadena member company Emgage to learn more about the software world and what they're doing to change it. We teamed up with Santa Monica members Tampon Tribe to provide free, organic, body-loving feminine products to our members. Cross Campus had the pleasure of welcoming Oscar-nominated director Jeffrey Karoff & Double-Wide into our beautiful Downtown Los Angeles location to produce Cross Campus's first ever commercial spot. Vin has spoken several times at Cross Campus over the past two years, and his talks are famous for being chock full of useful tidbits that you can put into practice right away to turbocharge your marketing efforts. Our members are changing the world with their incredible missions and creating opportunities like never before. Take for example PowerMyLearning, members at our Downtown LA location and a national education nonprofit. NYX Cosmetics Founder Toni Ko achieved what might seem like the ultimate end-game for an entrepreneur. However, instead of the celebrations you might expect in the wake of such a coup, Toni had a very different reaction. The team at Icoms has been around for over 15 years and have developed software for international giants like Bridgestone, Nickelodeon & Comcast. Originally from Honduras, Icoms found their way to the States in 2010 and now call Los Angeles home. Affordable homes are few and far between in the Greater Los Angeles area, causing many to be renters for their entire lives. We spoke to Domuso, who has made it easier for renters to pay for housing and property owners to manage payments. We started Cross Campus with the vision of re-imagining the work environment around the needs of today's creative professional. Four years and four locations later, the Cross Campus experience now centers on the idea of a balanced worklife. Dollar Shave Club founder Mike Dubin launched his subscription-razor company largely on the strength of a now-iconic viral video. As President Obama's term in office comes to a close, we're revisiting the day that #44 came to Cross Campus Santa Monica to deliver a town hall for a select group of members and guests. We interviewed the creative director of Imagesound Group, Andrew Wintner. He and his team work out of our Downtown LA location and create sound experiences that give retail and leisure brands their unique vibe. As any entrepreneur who has sold a business can attest, the time leading up to and the time immediately after a sale can be some of the most emotionally-charged and challenging periods in the lifespan of a company. Dollar Shave Club Co-Founder and CEO Mike Dubin spoke on a variety of topics during an edition of Startups Uncensored, a fireside chat-style event hosted by serial entrepreneur Jason Nazar. The motivations that drive CEOs and founders to sell their businesses are not always as clear-cut you might expect. Twenty-five year old Danish champion sports car driver Christina Nielsen came to Cross Campus Santa Monica in Feb. 2017 to give a talk on the business of sports car driving. The team at Banian Labs are helping travelers get the most out of their trips through their network of local insiders and their dedicated team. We interviewed founder and CEO Benny Xian about what makes his company so unique. VidroMedia is a boutique, full-service creative agency with a passion for working with progressive clients focused on making a positive impact in our world. It is a pleasure to feature them as our first spotlight company of 2017. In Jan. 2016, best-selling author, entrepreneur, and investor Tim Ferriss hosted his first live event in LA with an incredibly generous MARATHON five-hour Q&A at Cross Campus Santa Monica. Digital LA's Fashion Startup Showcase highlighted innovative startups, brands, and tech during LA's Fall Fashion Week. This was LA's first and only fashion show where online fashion startups had models wearing their looks on the runway. Combining its ten-year history in both software development and content marketing, Circos has created the ultimate VR studio focused on the travel and luxury sectors. We spoke to the Downtown LA member company to learn more about what they do. Cross Campus proudly hosted the NASA Space Apps Challenge at our Pasadena location in Apr. 2016. NASA Space Apps is considered one of the world’s largest hackathons and is sponsored by Microsoft Azure. Pepperdine University School of Law and The Geoffrey H. Palmer Center for Entrepreneurship and the Law dropped a knowledge bomb (and many more) during their 2015 Drone Entrepreneurship Conference. Light-Rail Service Reaches the Beach! All of our locations are officially within walking distance from metro stations in greater LA with the grand opening of the Expo Line in Santa Monica. Longstanding Cross Campus member and Founding Executive Director of Beautify Earth Evan Meyer teamed up with House of Meggs to beautify our Santa Monica location. Are you #TeamOcean? After XPRIZE LOOP's fun event and enlightening panel on ocean acidification, we sure are! It's not every day that you find a Tesla parked in your workspace. But thanks to the massive garage door at our Santa Monica space, that's what served as the centerpiece for the keynote by Javier Verdura, Director of Product Design at Tesla Motors. This month’s Member Spotlight highlights Santa Monica member Jennifer Killham, PhD, a Course Coordinator with the Early Childhood Education Online program at the University of Cincinnati. Magnetic Creative is a branding and engagement agency seeking to uncover the truth in brands and amplify it for the world. We sat down with CCO Dave Korinek for the full scoop! Cross Campus Co-Founder Dan Dato spoke to KCAL9 News about LA's booming tech startup scene. It's clear to see co-working is no longer a regional trend, but a worldwide market that continues to grow in popularity. Bisnow spoke to Cross Campus CEO and Co-founder Ronen Olshansky about the boom. We’re back in action with some of the best news in tech & business from this past week. This month’s Member Spotlight highlights Pasadena member company Market it Media Group, a full-service digital marketing agency founded by award-winning website designer, developer and Internet marketer Marci Rosenblum. It has been an absolute pleasure to have been a partner and host for Innovative Pasadena’s Connect Week 2016, a series of independently organized seminars, workshops, and social events across Pasadena. Want the best news and advice for entrepreneurs, but don’t have time to browse the web? Look no further! As summer comes to a close, we're working on re-focusing and re-strategizing to attain our goals. Read on for some inspiration and advice from some of our favorite publications so that you can get one step closer to achieving yours, too! This month’s Member Spotlight highlights Pasadena member company BC Design Haus, a strategic design and branding agency that specializes in creative branding and understanding the power of design. We're becoming quite settled in at our new location in the heart of Downtown Los Angeles and so lucky to be called home for some of the most innovative companies in our community. We're coming at you this Friday with a fresh round of resources! This week, we're taking a look at how to be more productive, innovative and successful as entrepreneurs. Check out what we've been reading on some of our favorite news sites and blogs to get inspired! We're all about motivation this week, especially because the warmer temperatures are tempting us to hit the beach instead of the office. See what we've been reading for some inspiration from our favorite publications! This month’s Member Spotlight highlights Santa Monica member company JUCY RV Rentals, a mini RV and motorhome company offering travel solutions for the budget-conscious, adventurous traveler. Los Angeles Mayor Eric Garcetti returned to Cross Campus yesterday to help celebrate the launch of the Downtown LA location. From Tesla's announcement to buy SolarCity to Twillio's IPO, it's been a big week for tech and startups. Read on to learn more and gain some insights on how to get your own business to reach new heights in this week's roundup of Friday Finds! This month’s Member Spotlight highlights Downtown LA member company dotstudioPRO, a digital video power tool that gives today’s entrepreneurs total control over delivering, monetizing, branding, analyzing, and maximizing their content online. Another Friday means another link roundup of our favorite startup and entrepreneur news. We've come across some really great advice for entrepreneurs and startups this week! This month’s Member Spotlight highlights Pasadena member company Innovate Pasadena. a nonprofit organization that aims to create a vibrant ecosystem of technology and design innovation in the greater Pasadena area. Our brand new 33,000 square foot campus is centrally located in the heart of Downtown LA across the street from the 7th & Grand Metro station, just a block off of restaurant row. This week we came across some interesting insights on the future of entrepreneurship, how to be a good leader, and new ways to grow your business. With the opening of our Downtown LA location, we're pumped to explore the area and see what it has to offer. Cross Campus hosted an Emerging Digital Technology and Government Summit at our Santa Monica location on Monday, May 2. TGIF! End the week learning tips on how to grow your business and be a successful entrepreneur. We're back with another link roundup! Coworking, How Big Can it Get? Cross Campus Co-Founder & CEO Ronen Olshansky talks the future of coworking. In case you missed it, Cross Campus was featured in the business section of the LA Times!